Here are a list of removal companies based in Noffolk. They are listed in order of the number of reviews and likes. At Bunn Removals we take great pride in the service we offer to anyone moving home. We are a professionally run business, based near Norwich, covering Norfolk and Suffolk and moving people across the UK. We have developed an excellent reputation due to the care and attention we pay to every detail. A reliable and friendly company with branches in lowerstoft and norwich, providing local, national and european removals and storage with excellent rates and stress free moves. With 18 years experience Alders Removals & Storage are a family run business dedicated to providing customers with the highest standards of service, combined with a very competitive pricing structure. We have our own secure storage facilities, comprising of a modern industrial building which is fully insulated and situated in east Anglia. We also have containerised storage facilities near the M25 in Kent. Glasswells Removals have over 60 years' removals experience. Moving both nationally and overseas, with a full fleet of vehicles and a team of experienced staff, Glasswells' service is flexible and professional. From full packing to self-pack, they will supply everything, including many storage options, to help your move run smoothly. Jarretts Removals established since 1911 with professional and friendly staff. Free quotations and advice, domestic and commercial removals, long distance and local, secure storage facilities, full packing service available. Piano and antique specialists. European and worldwide relocations undertaken. Colemans Removals is a family run removal company in the heart of East Anglia, serving Norfolk, Suffolk and Cambridgeshire. Colemans Removals was established in 1979 and endeavours to give a professional, personal removal and storage service tailor made to your requirements. A small and local company just starting out in the area. They have fully trained staff with years of experience working for a leading international mover. Being a smaller company they can offer a more competitive price without substituting quality of service. We specialize in low cost removals and storage. We also offer a national and international delivery service. Hadley and Ottaway offer a range of removal services which are aimed at the commercial and domestic markets. We also offer international removals and storage. Hadley and Ottaway are proud members of the British Association of Removers. 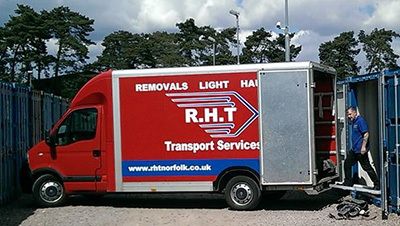 RHT Removals offer house removals in and around Norfolk including Great Yarmouth, Norwich and Stalham. They are a small company who offer van and driver hire as well as the traditional full house removals.